← Which way did you say? Cow Creek Road is the eastern end of Ouray CR 12. 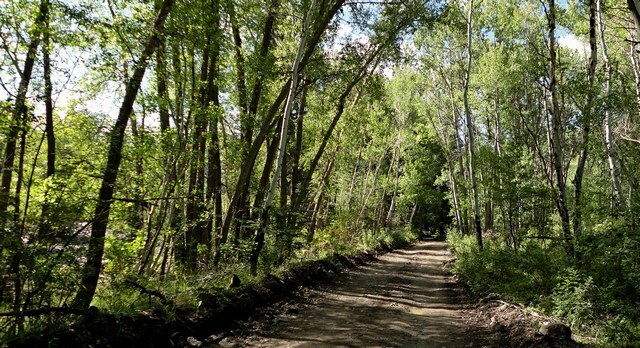 The word that kept coming to mind as I rode the lengthy road this morning is “sylvan,” which comes from an old French word meaning “forest diety.” To say the area is beautiful is to miss the point. It’s stunning and takes you back to your primeval forebears who lived deep within the forests. The sign is at the intersection of CR 12 and CR 10C, and is shown as Point A on the accompanying GPS map. It’s easy to get to. 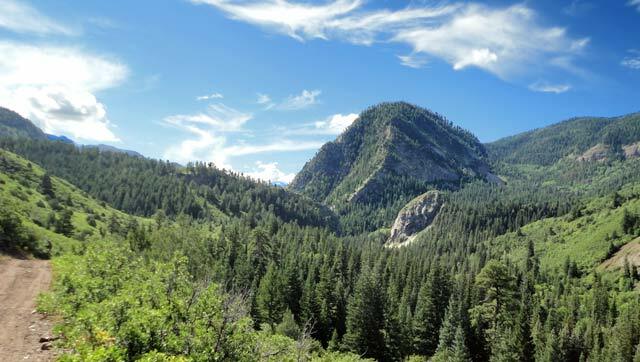 From Ridgway, Colorado, take Ouray CR 12 (access just south of town—it goes east) for several miles, following a few twists and turns. You’ll come to the sign shown in the photo above, which is at Point A on the GPS map. Please note that the wonderful all-weather surface you’d been enjoying on CR 12 has now come to an end. This road is best taken dry, although it wasn’t this morning because we had over a third of an inch of rain last night. The road travels east. Take a close look at the GPS map shown at the bottom of the post to be sure you know when to turn to the south—there are a number of false starts. The road winds through the trees (see top photo) and eventually comes to Cow Creek itself. In the past I’ve always had to stop here, because trying to ford Cow Creek looked just too dangerous. That’s why I waited until today, rather late in the season, when the river is down quite a bit. I had no trouble fording it on the motorcycle. The road is not often traveled—I encountered no other vehicles and found only one campsite occupied. I don’t think this road is well-known except to the locals. When I processed the GPS map, I noted that the trail isn’t all that far from other trails I’ve explored before. At one point it’s less than a mile from Ouray CR 8C, though you can’t get there from here. At another point it’s less than two miles from a number of double-track trails I’ve explored in the Stealey Mtn Trail Complex. There’s a sign telling you that you’re entering the Forest (although actually you’re entering BLM land—you get to the Forest soon enough). This is FR 857, and, as I understand it, still Ouray CR 12. 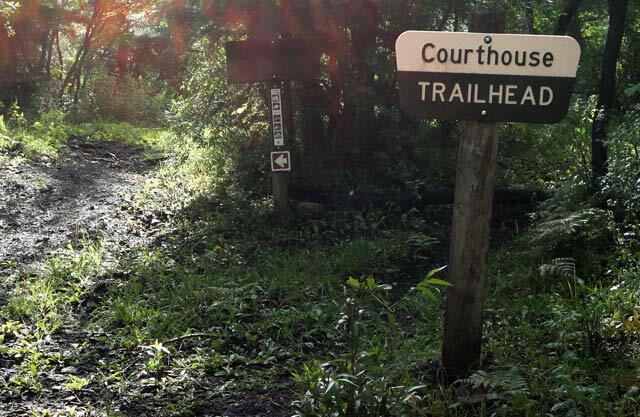 Before long comes the sign to the Courthouse Trailhead. There’s really no parking. Given the rain we’ve had this season, the trail looks like it goes through some lush tropical forest. That’s not true, of course, but the rain has really worked its magic this year. A little further up and you have some spectacular views. Two photos are below: the first looking up the canyon and the second looking back down. The ford at Red Creek was a trivial affair, with water about two inches deep. But, as the photo shows below, Red Creek has not been so low all season: in fact, you can see the extensive erosion damage done in the spring as the snows melted and we had several very rainy days. The Forest Service has repaired the road so that the crossing is trivially easy. The ford at Red Creek. That water is only about two inches deep. But earlier this spring it was raging, as shown by the erosion in the far bank. 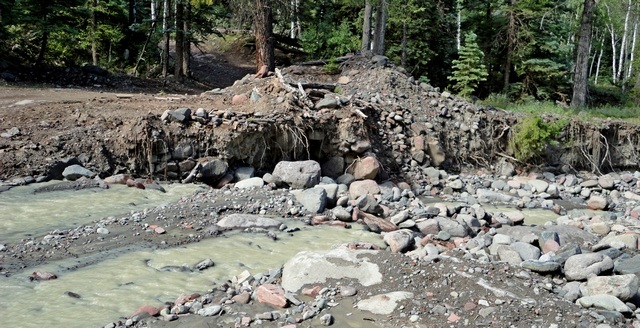 The Forest Service has repaired the ford. The road itself is right next to Cow Creek for several hundred yards. The Forest Service has repaired the road. Even so, erosion has cut into the repaired road so that the road and Cow Creek are one and the same thing for a few feet. The water was only inches deep, so I had no trouble crossing it. The photo below looks back down the road. Yes, to the right that is indeed the road. The beauty is obvious, but the road isn't. That's the road to the right. It looks rocky, and it is, but it's no trouble to traverse. My XT-250 had no issues. As I mentioned, it rained last night. And the road was muddy in places with numerous puddles. I had very little trouble with any of them until getting to the point on the GPS map where it says “Truly nasty mud!” I dithered about whether to attempt crossing and decided that I was there and would probably not be back for a long time. I squished and slid across. To my dismay, the road ended only about 150 feet further on! A very tiny turn-around provides parking for the Cow Creek Trail. So, I had to turn around and face that muddy stretch again. This time it was a real chore. I made it all the way across except for my rear wheel. It took quite a bit of yanking, twisting, and finally multiple attempts to walk the bike out under power. My tires were so glomped up with mud that they were slipping everywhere. The effort was exhausting for this 60-year-old, but I persisted and then sat and caught my breath for probably twenty minutes. I hate mud! 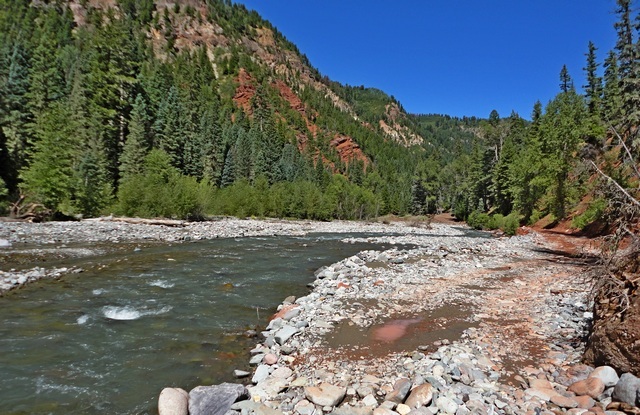 The photo below shows the Cow Creek Ford on the way back (Point B on the GPS map). The water is no more than a foot deep. The water is not clear, so fording on a motorcycle is a bit of an act of faith, but I had no issues. Cow Creek Ford. The water is not deep and the bottom smooth enough that I got my Yamaha XT-250 across without issues. Below is the GPS map. It’s a great, very beautiful hideaway that’s seemingly known only to the locals. Cow Creek GPS Map. The coordinates shown may help you find various features. See text for Points A and B. Beware of mud. 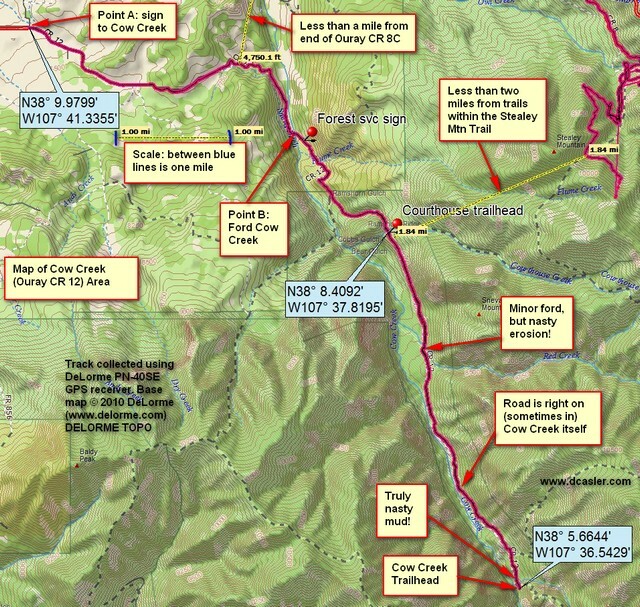 This entry was posted in GPS Tracks, Motorcycling, Ouray County and tagged Cow Creek. Bookmark the permalink. leaving springfield, missouri the first of july and driving my 4×4 colorado to colorado for a week tent camping. would like to know IF this would be a good area for a base camp off the beaten path? we would be going on some drives around telluride, ouray, animas forks,cataract gulch,lake city, cooper lake area, etc…. I’ve been researching for a month now every nite on the web and your pictures and story are making me very excited about my future trip. any info on this area would be a big help. thanks for the info.